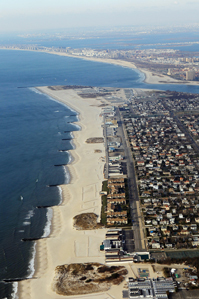 Superstorm Sandy, which devastated portions of New York, New Jersey and Connecticut last October, has revived longstanding debates about coastal development. Congress has approved more than $60 billion in relief funding for Sandy, which ranks as one of the most destructive storms in U.S. history. Future storms could be even worse because of climate change, which is raising global sea levels. New York officials are considering building floodgates to protect against storm surges, one of many strategies under consideration. Some experts argue that to make coastlines better able to withstand extreme weather, storm-damaged houses in vulnerable zones should not be rebuilt. Meanwhile, critics blame the federal flood insurance program, designed to help homeowners who cannot get private coverage, for subsidizing risky development with taxpayer dollars. But advocates say the program is needed to protect homeowners against catastrophic loss.